During the "Saisons croisées France-Afrique du Sud", or "French Days" which took place in 2012 in South Africa, UCT organised a series of conferences for science popularisation. 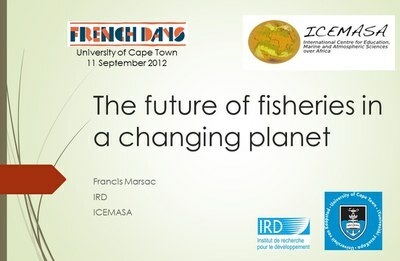 Francis Marsac (IRD) was invited to deliver a talk on the consequence of global changes on fisheries, worldwide. His presentation covered a range of stocks and fisheries, such as shrimps in Madagascar, tuna in the world ocean, Alaskan salmon, North Atlantic cod, blue shark in Eastern Australia and a sub-tropical reef fish community.